Respiratory Infections can quickly become life threatening if not treated at the first signs of illness. Respiratory infections can be viral or bacterial in nature. Clinical manifestations of respiratory infection include rhinitis, laryngitis, tracheitis, and pneumonia. (Mitchell). Predisposing factors for upper and lower respiratory tract infection are sub-optimal environmental temperature; aromatic, dusty, or unsanitary bedding; concurrent disease causing immunocompromise; and aspiration of material from an oral infection. 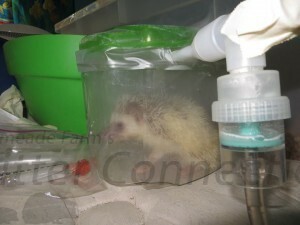 Lack of cage or transport cage ventilation compromise the air quality in the hedgehog’s environment. Respiratory illnesses that transmit from people to animals or from specie to specie are not common but it is possible for a human or another animal species to be a vector for respiratory illness. Multiple people were sick at a large breeder gathering. Many of the attendees’ herds became infected with an Upper Respiratory virus. Some breeders had not taken animals to the gathering or brought animals home from the gathering and still had an URI outbreak in their herds. On another occasion, one of the largest outbreaks started after they allowed a cat with URI in their house. Hedgehogs have many of the same signs and symptoms of an upper respiratory infection (URI) as other animals. The most basic sign of an URI is sneezing and/or mucous discharge from the nose that is not clear. The discharge may be cloudy or colored and tends to be thicker than normal nasal discharge. Nasal discharge may accumulate on the nose or the inside of the front legs. 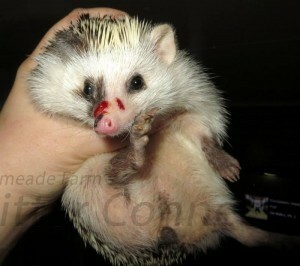 Not all hedgehogs that sneeze have a respiratory infection. Small animals tend to hide signs and symptoms of a health issue until the problem becomes severe. Therefore, when you notice this problem it is important to see a veterinarian right away. Your hedgehog will need to be treated with antibiotics for a bacterial respiratory infection. A variety of antibiotics are used to treat respiratory infections. The Exotic Animal Formulary (Third Edition) by James Carpenter, MS, DVM recommends using Trimethoprim/sulfa specifically for treatment of respiratory infections. Amoxycillin and clavulanic acid (Synulox/Augmentin) are recommended by Irish Wildlife Matters. Oxytetracycline in food for five days, Amoxycillin (Clamoxyl), penicillin and lincomycin are all antibiotics that are recommended in the British Small Animal Veterinary Association’s Manual of Exotic Pets. Dr. Cathy Johnson-Delaney recommends using Trimethoprim sulfa twice a day by mouth or intramuscular injection or Enfrofloxacin by mouth or intramuscular injection. Other veterinarians my choose other antibiotics including but not limited to Doxycycline and Enrofloxacin (Baytril). Your veterinarian may need to administer subcutaneous fluids if your hedgehog is dehydrated. A repeat dose of antibiotics or a different antibiotic may be required if the infection is not cleared with the first dose. A nebulizer or oxygen therapy may be necessary to assist breathing. This hedgehog was treated with a bronchodilator every 12 hours, an antibiotic once a day, and when needed plain saline at night. There was a humidifier going 24 hours/day in the hedgehog’s room. He was also treated with oral antibiotics every 12 hours and was supplemented with probiotics and extra calories. Add an air purifier and a humidifier to the room where the hedgehog is housed. Antibiotics can cause a their GI system a lot of stress. Soft stool and green stools are not unheard of. You can supplement with probiotics (acidolphilus) given mid way between antibiotic doses to help the GI out. I typically just use the powdered acidolphilus and sprinkle it onto some kibble or some other favorite treat (apple, watermelon, etc). However, I have had hedgehogs that were only eating via syringe feedings and would either add the powder to the syringed food, or if they accepted it I would add a little plain yogurt to assist. Just make sure you give it to her between antibiotic doses and not at the same time. The antibiotic will kill off any good effects from the probiotic if they are given too close together. Look in the human supplement section for a high count acidophilus. It should be kept cold. Offer a second bowl of water with chamomile tea with mint and sweetened with a bit of honey. Simply make a cup of chamomile and mint tea, sweeten it slightly, cool it and put it in another bowl. Offer wet fruits like watermelon to keep up hydration. Keep a very close eye on her weight and feed her whatever she’ll eat to keep her weight up. Thank you Kat Austin from Happy Hogs for sharing her story. But today I was cleaning cages and she was in her igloo crying really softly. When I pulled her out, I found her self-mutilating her sore nose. This thing is brutal! I cleaned her paws and face but the bleeding was awful. The sores readily show yellow, fatty tissues when not covered in blood. (In one photo, I caught her mid-sneeze and it looks hilarious.) If an ant bites you, and it hurts, you smack it and get it off. Her nose hurts her and she wants the pain away. It’s silly sounding but very basic thinking processes. Dogs, cats, etc do it too. Unfortunately no one has been able to figure out how to put a cone on a hedgehog. Isolate new hedgehogs for a minimum of two weeks. Keep the cage clean and well ventilated. Monitor the hedgehog’s cage temperature. Recommended temperature is 75-85 degrees Fahrenheit. It is critical for the cage to have warmer temperature ranges than cooler temperature ranges. Carpenter, James W., Carpenter, MS, DVM, Dip. ACVM. Exotic Animal Formulary, Third Edition. 2005. Elsevier Saunders.